Received May 31, 2018; Accepted August 2, 2018. The persimmon cultivar Gamnuri (Diospyros kaki Thunb.) is a new pollination-constant astringent (PCA) type developed by the Sweet Persimmon Research Institute of Gyeongsangnam-do Agricultural Research & Extension Services. This cultivar was selected from the seedlings of the cross between the Sunami and Johongsi cultivars in 1997. After being selected as a prominent seedling line in 2006, its tree growth and fruit characteristics were investigated from 2016 to 2017. The tree grew vigorously during the young stage and showed a spreading shape as it aged. Only female flowers bloomed. The flowering and harvest dates were May 20 and October 16, respectively, which was similar to that of the Sangju-Dungsi control cultivar. The fruits of Gamnuri were characterized by a red-orange skin color with a round, flat shape. The average fruit size was 370 g, which was 1.7 times larger than that of the control. Ninety-three percent of the fruit was marketable with a rare occurrence of calyx-end cracking, which was similar to that of the Sangju-Dungsi cultivar. The soluble solids and flesh firmness were 16.7°Bx and 15.8N, respectively, which was lower than that of the control. Notably, matured fruits maintained their quality for an extended period of time on the tree. When the fruits from the Gamnuri cultivar were processed into sliced-dried fruits, the product had a great taste with good color. 감(Diospyros kaki Thunb. )은 중국, 한국, 일본과 같은 아시아 국가에서 주로 재배하며(Yonemori et al. 2000), 이들 3개국이 전세계 감 생산량의 84% 이상을 차지한다(FAO 2016). 한편 국내 감 생산량은 2010년 390천 톤에서 2016년 353천 톤으로, 재배면적은 31천 ha에서 25천 ha 로 감소하였으나, 감 생산액은 전체 과수 생산액의 10% 이상을 차지하고 있어 여전히 중요한 과수로 자리매김하고 있다(Statistics Korea 2016). 감은 재배품종에 대한 기준에 따라 완전단감과 비완전단감의 2개의 주요 그룹으로 분류할 수 있고(Akagi 2011), 수확 시 과실의 떫은맛의 정도, 종자의 유무, 과육색에 따라서 다음과 같이 4가지 형태로 분류할 수 있다: (1) 완전단감(pollination-constant non-astringent, PCNA), (2) 불완전단감(pollination-variant non-astringent, PVNA), (3) 불완전떫은감(pollination-variant astringent, PVA), (4) 완전떫은감(pollination-constant astringent, PCA) (Yonemori & Sugiura 2000). 이들 4가지 형태 중에서 완전단감은 자연돌연변이 표현형으로써 성숙하는 동안에 수상에서 자연적으로 탈삽이 되는 반면에, 불완전단감, 불완전떫은감, 완전떫은감 같은 비완전단감(non-PCNA type)은 과실이 완전히 성숙할 때까지 과육 내 가용성 탄닌의 함량이 높게 유지된다(Akagi et al. 2009). 따라서 비완전단감(떫은감)은 탈삽 또는 연화과정을 거쳐야만 이용 가능한데, 현재 국내 감 가공 산업에서는 떫은감을 이용한 곶감, 감말랭이, 연시, 아이스홍시에 대한 소비자 수요가 점차적으로 증가하고 있는 추세이다(KREI 2018). 한편, 떫은감의 국내 주요 재배품종은 ‘갑주백목’인데 이는 탈삽형태가 불완전떫은감으로서 주로 ‘연시’ 형태로 소비되고 있으며, 종자 주위에 갈반이 짙게 형성되어 가공용으로는 불리한 점이 있고 과피에 검은 줄무늬와 반점 형성이 심해 외관이 나빠지기 쉬운 특성을 지니고 있다(RDA 2013). 또한 이 품종은 8월 이후 낙과율이 높아서 안정 생산에 어려움이 있다. 완전떫은감 재배품종으로는 ‘청도반시’, ‘산청고종시’, ‘상주둥시’ 등이 가공용으로 많이 이용되나 대부분 과실 크기가 작다. 그러나 최근 건조 자동화 장비 보급이 늘면서 대과를 활용한 곶감 및 말랭이 제조가 유리해지고 있다. 특히, 소과의 경우 수확 및 박피, 절단 등 가공 과정에 노동력 소모가 많아 생산비 절감을 위해서는 대과종 떫은감 육성이 필요하다. 이에 단감연구소에서는 안정적인 착과가 가능하고 과피와 과육이 깨끗한 고품질 떫은감 대과 품종 ‘감누리’를 육성하였기에 육성경위와 주요특성을 보고하고자 한다. 1997년에 경남 창원에 위치한 단감 과원에서 과실의 숙기는 늦으나 당도가 높은 완전단감 ‘스나미’ 품종과 불완전단감이긴 하나 숙기가 빠른 ‘조홍시’ 품종을 교배하였다. 완숙된 교배과실을 수확하여 종자를 채취하였고 1998년 4월에 3L 포트에 파종하여 비가림 하우스에서 1년간 키운 후 62개체를 1999년 봄 노지시험포에 정식하여 재배하였다. 2006년에 이들 개체 중에서 과실이 크고 특성이 우수한 완전떫은감 계통 ‘97-6-50호’를 1차 선발하였다. 경남 김해에 위치한 단감연구소 시험포에 재식된 4-5년생 ‘상주둥시’/공대(대조 품종)와 계통 ‘97-6-50호’/공대를 6주씩 선정하여 2016년부터 2017년까지 수체 생육과 과실 특성을 조사하였다. 조사 방법은 농림축산식품부 국립종자원의 신품종 심사를 위한 작물별 특성조사요령에 준하였다. 숙기가 빠른 대과종 감 품종 육성을 위하여1997년에 경남 창원 소재 단감과원에서 만생종 완전단감 ‘스나미(Sunami)’와 조생종 불완전단감 ‘조홍시(Johongsi)’를 교배하였다. ‘스나미’는 숙기 10월 29일, 평균과중 230 g의 육질이 단단한 품종이고, ‘조홍시’는 숙기 9월 25일, 평균과중 150 g으로 과육에 갈반이 많이 형성되는 품종이다. 수확한 과실의 종자를 채취하여 이듬해 파종, 육묘하여 62개의 계통을 양성하였다. 양성한 계통 중에서 과실이 크고 과실 품질이 우수한 계통 ‘97-6-50호’를 2006년에 1차 선발하였다(Fig. 1). 공대에 접목하여 만든 묘목을 대상으로 2016년부터 2년간 수체 생육과 과실특성을 조사하여 대조품종인 ‘상주둥시’와 비교하였다. 그 결과 과실의 품질이 우수하고 특성이 안정적으로 발현되는 것이 확인되었고, 직무육성 신품종 선정심의회에서 ‘감누리(Gamnuri)’로 명명하였다. 2014년 11월 19일 식물신품종 보호법에 의거하여 품종보호권을 출원(출원번호: 2014-17) 하였고, 2018년 4월 18일에 등록번호 제 162호로 품종등록되었다. Pedigree diagram of ‘Gamnuri’ persimmon cultivar. ‘감누리’의 발아기와 전엽기는 각각 4월 1일, 4월 8일로 ‘상주둥시’ 보다 각각 12일, 5일이 늦었으나 평균 개화기와 성숙기가 대조품종과 큰 차이가 없었다(Table 1). 유목기 ‘감누리’의 수세는 강한 편이었으나 수령이 증가함에 따라 나무 형태는 개장형으로 되었다(Table 2). 1년생 가지의 길이는 짧고 중간 부위 직경은 가는 편이며, 양광면은 회갈색이었다. 1년생 가지의 피목모양은 ‘상주둥시’와 같은 타원형이었으나, 피목의 크기와 수는 적었다. 꽃은 ‘상주둥시’와 같이 암꽃만 피는 형태였다. 엽신은 길고 난형이었으며, 엽신의 기부는 넓은 뾰족, 정부는 첨두 모양이었다. Growth properties of new cultivar ‘Gamnuri’ and ‘Sangju-Dungsi’ (control) persimmons. Values are means recorded from 2016 to 2017 in Gimhae. Tree characteristics of new cultivar ‘Gamnuri’ and ‘Sangju-Dungsi’ (control) persimmons. Values are means recorded from 2016 to 2017 in Gimhae. ‘감누리’의 과피는 붉은 오렌지색으로 ‘상주둥시’ 보다 붉고, 과실 모양은 대조품종보다 약간 납작한 원형이었으며 과실 횡단면도 원형에 가까웠다(Fig. 2). 탈삽형태는 완전떫은감에 속하였고(Table 3, Fig. 2), 과실 크기는 370 g으로 ‘상주둥시’ 보다 1.7배나 컸다. 가용성 고형물 농도와 경도는 각각 16.7°Bx, 15.8N으로 ‘상주둥시’ 보다 낮았으나, 정부열과의 발생이 드물고 상품과율은 93.0%로 비슷하였다. 성숙기 이후 일부 과실을 수확하지 않고 나무에 둔 결과, 나무에서 오랜 기간 연화되지 않고 과실품질이 유지되었고, 감말랭이 제조 시 색택이 좋으며 식감이 찰지고 우수한 특성을 보였다(자료 미제시). 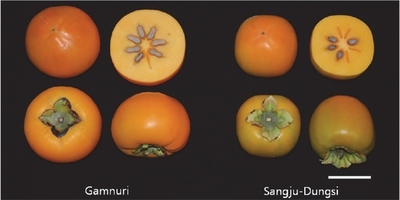 Fruit characteristics of new cultivar ‘Gamnuri’ and ‘Sangju-Dungsi’ (control) persimmons. Values are means recorded from 2016 to 2017 in Gimhae. Shape of mature fruit of ‘Gamnuri’ and ‘Sangju-Dungsi’ (control) persimmons. Scale bar = 5 cm. 대과종인 ‘감누리’는 과다 착과 시 수세가 약해질 우려가 있으므로(Choi et al. 2010), 적정 착과량 유지를 위해 개화 전에 결과지당 1뢰를 남기고 적뢰를 하였다가 생리적 낙과가 끝난 후에 엽과비가 15-20이 되도록 적과 작업을 해주어야 한다. 감말랭이로 제조하였을 때에는 색택이 좋고 식감이 우수하지만, 과즙이 적은 특성 때문에 연시용으로는 적합하지 않다. ‘감누리’는 경상남도농업기술원 단감연구소에서 1997년에 ‘스나미’와 ‘조홍시’를 교배하여 얻은 실생으로부터 선발한 완전떫은감 신품종이다. 1998년부터 2005년까지 양성한 교배실생 중에서 2006년에 계통 선발을 실시하였고, 수체 생장과 과실 특성 조사를 2016년부터 2017년까지 수행하였다. ‘감누리’는 수세가 강하고 수자는 개장성이며 암꽃만 핀다. 개화기와 성숙기는 각각 5월 20일, 10월 16일로 대조품종인 ‘상주둥시’와 비슷하였고, 과피는 붉은 오렌지색이고 과형은 원형이었다. 평균과중은 370 g으로 ‘상주둥시’ 보다 1.7배 크고, 정부열과 발생이 거의 없으며 상품과율이 93.0%로 높았다. 그러나 당도와 경도는 각각 16.7°Bx, 15.8N으로 대조품종보다 낮은 편이었다. 한편, 성숙 이후에 나무에서 오랜 기간 연화되지 않고 과실 특성이 유지되고, 감말랭이 제조 시 색택이 좋으며 식감이 찰지고 우수한 특성을 보였다. 본 논문은 농촌진흥청 연구사업(세부과제명: 영양체 유전자원 보존관리, 세부과제번호: PJ01379101)의 지원에 의해 이루어진 것임. Akagi T, Ikegami A, Suzuki Y, Yoshida J, Yamada M, Sato A, and Yonemori K. Expression balances of structural genes in shikimate and flavonoid biosynthesis cause a difference in proanthocyanidin accumulation in persimmon (Diospyros kakiThunb.) fruit. Planta 2009;230:899-915. Akagi T, Ikegami A, and Yonemori K. Proanthocyanidin biosynthesis of persimmon (Diospyros kakiThunb.) fruit. Sci Hortic 2011;130:373-80. Choi ST, Park DS, Kang SM, and Cho YC. Effect of fruit-load on the growth, absorption, and partitioning of inorganic nutrients in young 'Fuyu'persimmon trees. Sci Hortic 2010;126:408-412. RDA (Rural Development Administration). Standard Agricultural Manual persimmon Growing. Suwon, Korea: RDA; 2013 p. 43-44. Yonemori K, and Sugiura A. Persimmon Genetics and Breeding. Plant Breeding Reviews 2000;19:191-225.